Service tickets are queries / requests / complaints etc. regarding a service or a product that was supplied by the organization and requires a treatment or a reference. This tab allows to create a new service ticket and display the list of service tickets related to this Client / Supplier card. This list of Service Tickets is also used for follow up, and to update the status of the service tickets, according to the relevant representatives activity and the customer. 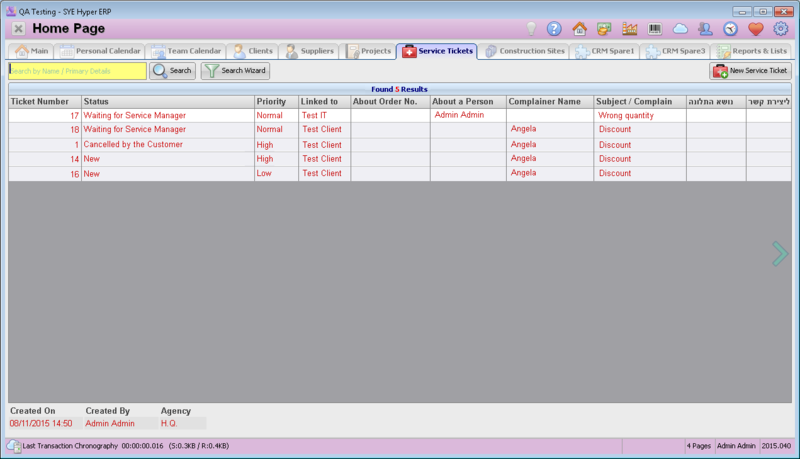 This table also presents the service tickets of the client website (Portal). Click here to go to this section. At the top of this window there is a search field to search for a Service ticket by Name / Primary Details. Fill in the required details and press the Search button. Alternatively, use the Search Wizard button, to use one of the filters or create a new one. The search results will be displayed in the table. Single click on a Service Ticket record will display additional information at the bottom of this window. The user can add more information fields, according to the requirements and needs. Double click on a service ticket to open it. This field should be modified according to the handling process and the activity of the organization representatives. The first default status is "New". A service ticket will be closed only after updating its status to one of the following statuses: "Completed" / "Declined" / "Canceled". The following statuses will be available only after filling in the "Treatment Guidelines by Service Manager" field: "Declined" / "Completed Against the will of the Customer" / "Completed by Compromise with the Customer" / "Completed with Full Customer's Satisfaction". Linked To If the service ticket was received from a Client or Supplier, it can be related to its ticket by choosing it from the list of Clients / Suppliers in this field. Subject / Complaint All of the relevant details about this query. It is very important to receive as much information as possible in order to Appropriately handle with this service ticket later. Delete this service ticket. This action is available as long as the "Treatment Guidelines by Service Manager" field is empty. Once updating this field, the service ticket can not be deleted. Write an Email regarding this Service Ticket. The details of this service ticket will be copied to the message body. Open the related Client / Supplier card (as defined in the "Linked to" field. Create a new task regarding this service ticket. The modification log displays all of the modifications from this service ticket and includes the modified field name, the old value and the new value. Print the service ticket. This option also allows to export this information send it by EMail. Save the modification and exit the service ticket. In this tab, the system admin can add or edit information fields according to the organization needs and requirements. For further information about Fields Layout and Rules, Click here. Create a service ticket from an Email message. These Email messages will be presented in the first table (Inbox). Send an Email from a service ticket. These Email messages will be presented in the second table (Sent Items). Public Service Ticket - A service ticket received from the web site. 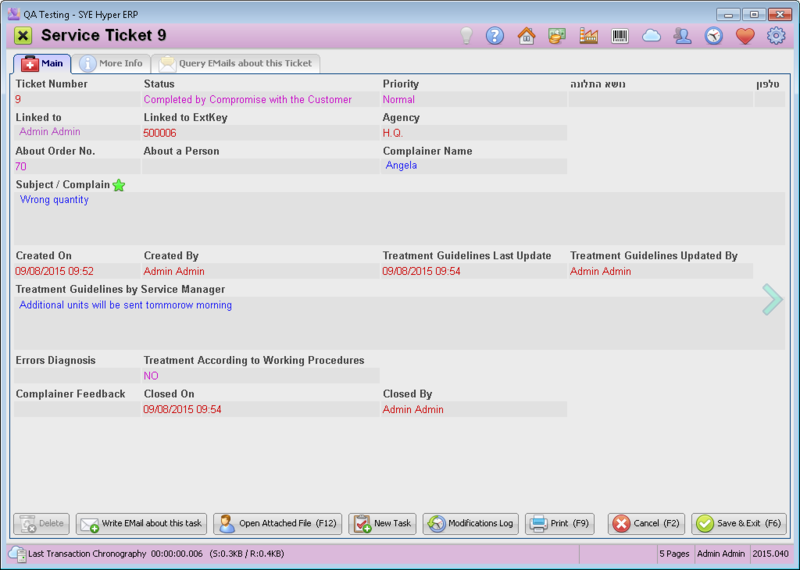 Private user Service Ticket - A service ticket received from a registered client. System Administrator - Please pay attention to the comments at the bottom of this page. Name This value will be received in the "Complainer Name" field. Phone This value will be received in the "Service_Phone" Spare field, as described below, in the "System Admin" section. Email This value will be received in the "Service_Email" Spare field, as described below, in the "System Admin" section. Message This value will be received in the "Subject / Complaint" field. Subject The value "Public (web page) Service Ticket" will be automatically filled in the "Service / Subject" Spare field. Service Subject This value will be received in the "Service / Subject" Spare field, as described below, in the "System Admin" section. The Hyper Website (Portal) is used by the organization clients for actions, that will be automatically updated in the Hyper system, according to users activities. SYE allows its clients to use a customized website which designed according to the clients needs and requirements. For further information please contact SYE customer service department. Service_Subject = 'spare strfld 01'; "select" type. Please Note - the spare fields must be defined exactly as described above. Service Tickets can be received from any website / landing page / contact page etc. In order to allow this option there are few required settings to define in the "Web Data Port" tab of the "Marketing & Web-Content" Module. Add a "Spare Group StrFld" to the client card and name it: Website Blocked Functions. In the "Spare Field Customization" tab, choose the "GroupSelect" as the Editor Type. Define the language of this field as English. (choose NO in the "Local Lang" field of the "Default String & Values List" tab. Add the "Website Blocked Functions" to the client card. Choose the required functions to block, from the list in this field.